As a full-time, second generation Real Estate Consultant, “I’m here to help you achieve your real estate goals.” I absolutely love real estate. When I work with Sellers, my marketing campaign is detailed and in full force. From flyers, postcards, slideshows, online presence, showings, staging, and more, it will be SOLD. I am a lifelong resident of the South Bay and can answer many of your questions about the area. The Lockwood Team has represented buyers and sellers on over 150 properties in Walteria and Victoria Knolls alone. The Lockwood Team are proud Sponsors of the Annual National Night Out Walteria Block Party, which promotes the neighborhood watch and sense of community. It is the biggest block party in Torrance. Each transaction supports the Children’s Miracle Network and children in our South Torrance Schools. Sarah Paris has been a South Bay resident for over 25 years. Having been brought up in the area, attended the local schools, and met many of the residents makes her one of the most knowledgeable agents to assist you in finding the best home in our community. Sarah is known for being detailed, dedicated, and determined. She is a member of the SBAOR South Bay Association of Realtors, CAR California Association of Realtors, and the NAR National Association of Realtors. She is conveniently a bonded and insured Notary Public. Sarah’s level of service is unmatched and guaranteed. 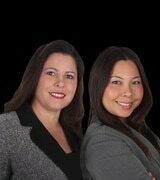 Julie Lockwood & Sarah Paris are the seller/buyer specialists of The Lockwood Team. With over 25 years of combined experience, they offer the knowledge, experience, service, and care for one of the biggest financial decisions in your life. Julie is hands on the entire time, focusing on negotiations from beginning to end. Sarah Paris is responsible for marketing and file management for every property. With her online marketing skills, your property will have maximum exposure. This Team has your best interest at all times to ensure a successful close.